With the short days and long nights I find that the winter season really affects my mood, so I try to stay as active as possible, even if it just means making it to the gym a few times each week. While the gym is a great option, I have found that playing a team sport and joining a league is an easy recipe for a bit of health and happiness this time of year. Here is a list of four sports that will keep you moving this winter, beyond the hustle and bustle of Christmas shopping and rushing around to holiday parties. When’s the last time you laced up your hockey or figure skates? Well it’s winter, and hockey season is here, so now’s the time to take up the sport again, or try it for the first time. Joining a hockey team is fun and offers a different experience than more traditional sports. Not a hockey fan? Taking skating lessons will teach you a new skill or improve your rusty stride. And, if you can’t skate, broomball is a fun activity that doesn’t require sharp blades. Your idea of basketball participation may be watching your favorite NBA or college athletes play this season, but it’s actually an extremely popular activity for winter sport leagues. Most gyms and recreational leagues include basketball on their dockets during the winter months. In addition to playing on a team, basketball is a great cardiovascular exercise and another excellent way to be active and social this time of year. If you’re not a fan of running on a treadmill, or you have difficulty being motivated enough to brave the harsh elements to hit the gym, why not play indoor soccer and have fun with your cardio workout. Indoor soccer leagues are another fun way to be involved in team sport. Oh, and don’t forget to communicate who’s bringing the post game refreshments! 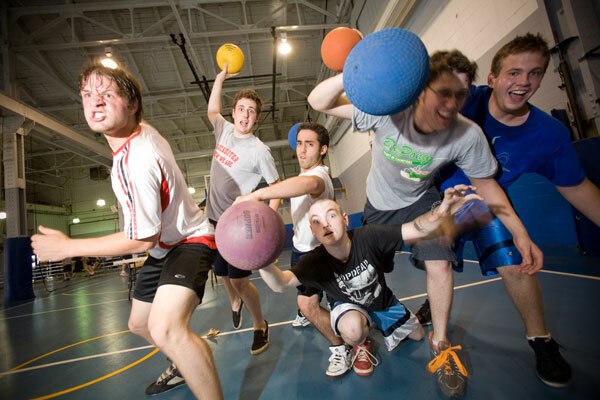 According to the movie Dodgeball, the five keys to the sport are dodge, dip, duck, dive and dodge, but the most critical element is getting active. Adult and youth dodgeball leagues are extremely popular recreational options nationwide, offering tremendous agility training. You’ll be afforded the opportunity to burn off some steam as you hurl those rubber spheres at competitors. And it’s guaranteed to be a hilarious time, full of laughs, just like it was in grade school. What are some of your favorite team sports to play during the winter months? This is a guest post from Ryan O’Leary, a sports media and marketing professional and co-author of Colorado Sports Trivia. Ryan O’Leary earned his Bachelor’s Degree in Broadcast Journalism from the University of Missouri and Master’s of Sport Management at West Virginia University. Ryan worked for the sports marketing agency Millsport before being hired to cover the 2008 Beijing Olympics for NBC and the 2010 Vancouver and 2012 London Games for CTV. Ryan is passionate about baseball, hockey and the sports industry at large and co-authored the book Colorado Sports Trivia, released in 2011.